Cambridgeshire's Guided Busway finally opened on the the announced opening day, August 7th 2011. It is built on the former track bed of the Cambridge-St Ives railway that principal objector CAST.IRON wanted to reinstate. The record breaking, budget-busting busway has generated vigorous disagreement between the proponent Cambridgeshire County Council and numerous objectors. Buses are finally running, but council tax payers have been taken for one hell of a ride for years. The build cost is hugely over-budget, and a protracted legal fight is imminent between Council and contractor BAM Nuttall. This website is an archive of the media coverage from 2003 to the present, with our own take on the events. No answer to "What local services will be axed?" But in-house - no involvement of HSE? Day of reckoning also delayed by 2 years? Wait until the schools go back. Finally it's open. We at NoGuidedBus.com can hardly believe it. £180 million later, and we find despite their promises, it's a White Elephant. Quelle surprise! Stating the obvious - it's a slow hard road to Cambridge City Centre. Only denizens of the Science Park living in St Ives may be pleased. What was that bump in the track? Council offers Pats on Backs all round. Gets Brickbats from residents. Lesser spotted bus may have been detected on busway. Not a "wow" moment though. Only 'claimed' to be ready?? Cambridge News unusually skeptical. Core services at risk as budget for Busway tramples funding for other council services? Another scintillating video not showing a recovery truck reversing for miles to reach a busted bus. Every little (bit of vaguely good news) helps? Handy for street party BBQ's ? Busway is a dog, says Whippet boss. 'Perennial delays which have dogged the busway cannot go on indefinitely any more'. Definitely not, indefinitely no more, not not not. Cllr Clarke guzzles from poisoned chalice passed to him by predecessors. How long will he last before being run over by a guided bus? April 11th - Why are staff employed on guided bus? But actually doing other stuff. Never mind, BAM will pay for them. "So that will end up as £10 for a new cats eye on the A14, £4,499,990 for cycling facilities and half a million quid for the councillors consultant mates"
Observer of Emperor cries out, "But he isn't wearing anything at all! Yes, you heard it right. Should we stop the dosh-clock now? Oh, it all makes work for the working man to do..
Why are staff employed on guided bus? Painting railings say LibDems. Oh, is there an election coming? S'alright, they'll stay stuck at home and won't vote. It's all BAM's fault so there! Feb 22nd - BUSWAY CONTRACTOR DATES "TAKEN WITH A PINCH OF SALT"
Says CCoC press office. Salt shortages imminent then, better stockpile? Has sense dawned at last? "Even the Official Monster raving Loony Party couldn't have thought of the guided bus. It is the biggest joke going". Spreading out the bad news? Two years on, blunderbus bosses finally notice that concrete beam gaps are too small. Faulty sensors blamed. Or is it censors? "I imagine it will take a lot of promotion to get people to use it after its reputation" - Who pays for that? Guided buses get green lights at junctions. Back to the old Rabbit & Partridge pies then? Popular cycleway sections liable to flooding will be closed off with gates to deter users. If you don't fix it, we will! But there's nothing wrong with it! Yes there is! No there isn't! Is Is! Isn't! Isn't! Toad in hole served up for animal lovers hopping mad over "corridor of death"
He's game for a laugh - The Fat Toad is a sure hit with foodies. A mothballed bus gathers no profit dust . Stagecoach in contract renewal gambit. 'Still work for BAM Nuttall to complete before the route can be handed over' Now where have I heard that before? Report to cabinet on 16/11/10: This is a defect. No it isn't! Yes it is! No it isn't! Christian Wolmar tells the tale: "It seemed a good idea at the time". Or is it 50m ? What's 10m between friends enemies? Oct 26th - "Please disclose all correspondence between BAM Nuttall and Cambridgeshire County Council relating to the proposed handover and opening of the guided busway in November 2009"
Bob can we fix it? No we can't! Busway would just add to traffic congestion. Yeah, yeah, predictable moaning about BAM:BAM holidays in December... just like last year. Yes, it's 'finished' again, this time the southern guideway. But Champagne is still in Bob's fridge. Projects that could have been saved if the authority had not sunk so much cash into the guided busway? Thanks for taking such lovely pics! BAM:BAM? no thank you m'am! Bus lurches twixt farce and fiasco. Sept 15th - Letter: What an odd contract! - "...recovery could be years away, if anything is recovered at all"
Sept 15th Letter - St Ives-Cambridge guided busway - what is Plan B on cost overrun? But the £90 million scheme is safe says Gubmnt. It's not popular but they won't can't stop it. Why? Won't be finished by Christmas then? Inspector Pegram: "I hate you Nuttall"
Sept 3rd - Guided busway: Cambs v Manchester - Prof Knowles: "I have concerns following my visit to Cambridgeshire." Bunker Bob busy updating his C.V.
See you in court Mr Nuttall? August 30th - Busway to open in the spring of 2011? A key part, or a forgotten part? But it has to be used, as the maintenance track floods! And this is in Summer! July 15th - Beleaguered busway opens its first branch line - Council jokes: "we've already logged the issue"
Just in time for Christmas maybe? Bunker Bob to get his shovel out? Council moots 'new deals' to raise more income from the guideway. Whatever do they mean? 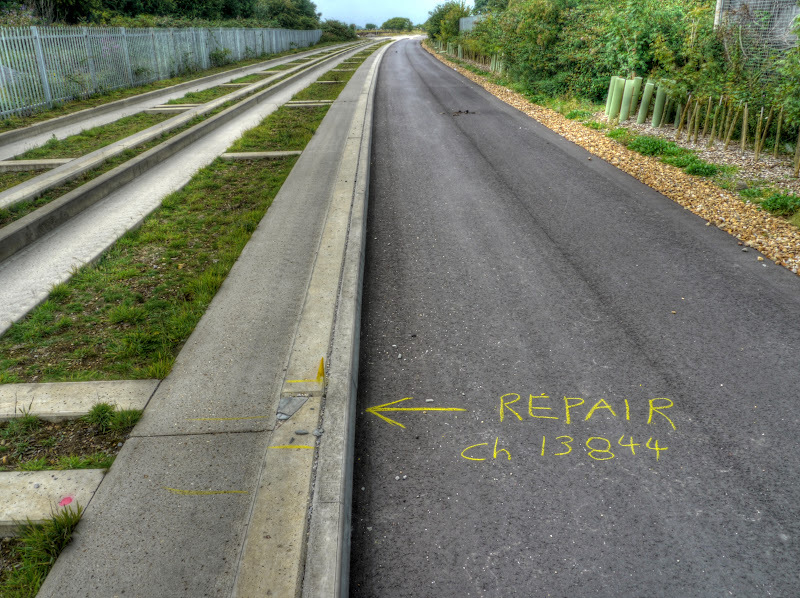 June 19th - Could rubber have erased guided busway problems? I thought the whole thing was defective from the start? So, council taxpayers not subsidising the guided bus project was a lie mistake wishful thinking? Julian won't be invited for coffee and sandwiches anymore at Shire hall. Pity, the sandwiches are pretty good. BAM:BAM -> BAM:BAM I'll get you Nuttall! May 18 - No opening date for guided bus until "at least July"
They can't help shooting themselves in foot giving us non-opening dates! County says "it's not our fault Gov"
Should it be rolls slowly forward? April 22 - "CCoC ...is confident its contractor will get cracking"
Like the concrete beams you mean? A good day to bury good news? No no, really, it isn't an April Fool article! "Critics paint a picture of a scheme in chaos, with project managers lacking experience and out of their depth"
So do you still believe government when they say "lessons will be learned" ? Unlikely to say that they took a radical approach: 50% overbudget! March 11th - Cambridge News article - Losing track of the start date for bus? Bam! Bam! Maxwell's silver hammer came down upon his head..
From our 'you couldn't make it up guv, department' - Luton busway to get gov funding! 6th Feb - Bob Menzies 'Head of Delivery' delivers himself to conference. Let's hope he's on time! "There are bits to finance the guided bus..."
Local taxpayers may subsidise costs by £1 million extra a year for ...how long? Dec 4th - County press release: No worries mate! No chance though of getting run over by a bus..
Letter: No-one held to account - "so many promises made to the public enquiry have been broken"
Poll: Are you looking forward to the opening of the guided bus? 81.5% said no. Nov 18th - Where will the bus go from here? Nov 13th - Will guided busway be ready in time? Well that's an easy one. No! Nov 6th - Cast.Iron slams system as "Misguided and Bust"
There should be competition to spot all the dubious 'facts' offered to the viewer..On second thoughts that's just too easy Err, just when did you say it was opening? What! Even their video won't open on time??!!! Bus managers annoyed - "We hate you Pegram"
A moo threat to busway? Aug 7th - Shona Johnstone blogs "..I am glad that at last, the end appears to be in sight." Good old Shona, she's good for a laff! July 24th - Shona Johnstone blogs "...we should threaten to abandon Northstowe". So why do we need the busway? The (December 2008) Busway Carol. Better late than never, and still apt in November 2009! Dec 12th - Letter - Is the busway viable? Dec - Busway in financial difficulties? May 1st - Tim Phillips discusses the damage to the concrete beams. Faults will jolt the steering. Busway is a strategic failure. They did not listen, they did not know how, perhaps they’ll listen now? Sept 1st - Cambridge Huntingdon Rapid Transit - the misguided bus? April 1st - Star 107 News Report: CAST.IRON misled the public! Feb 21st - TWA plans "very detailed" according to Cllr Johnstone. "One bit that sticks in my mind was a line from the environmental assessment part of it which said 'A small mammal was heard eating'...a ham sandwich??" Cllr Johnstone's reposte "Absolute Rubbish"
McNulty damns busway with faint praise. Shona is naturally delighted. Reality check - what did the County Council originally say in their Guided Bus Newsletters?